I’ve always been intrigued by maps and have made a special effort to visit every coastal spot in England at the end of a white road. 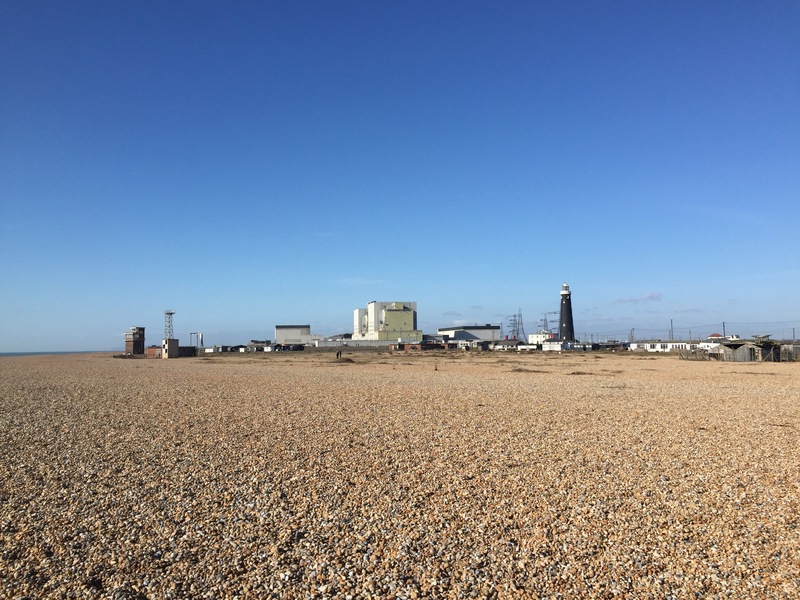 Dungeness near Rye in East Sussex is one such place. It is so familiar to me from a life time of titbits collected that I was surprised when actually visiting today that I hadn’t been here before. 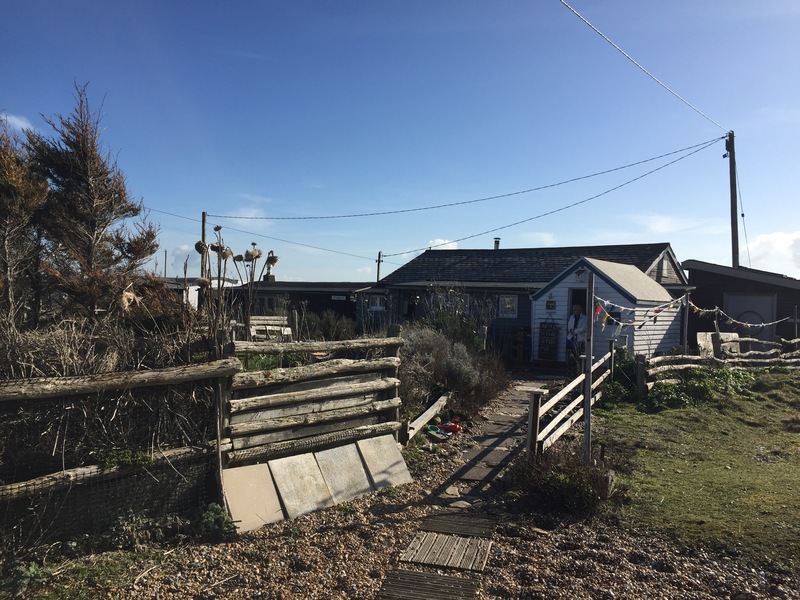 Like most visitors, it was the desire to see Film director Derek Jarman’s beachside home with its world renowned garden that had drawn me here. Admittedly February isn’t the best time to see it but I was here with a spare day and a mother in law ( one of my choice of four!) keen to come along. 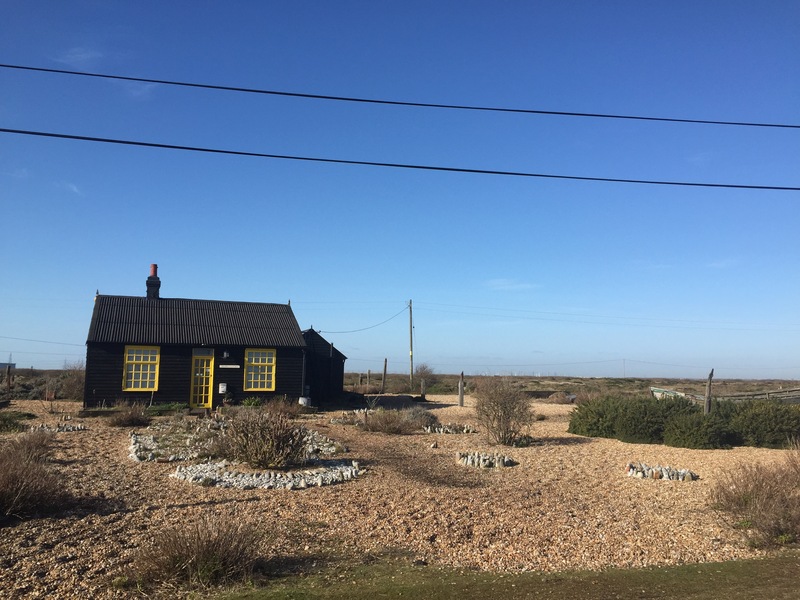 Pat is a Hastings girl born & bred and so although she knew all there was to know about Dungeness she had explored farther than the main village and was unfamiliar with Derek Jarman. We stopped in the village by the narrow gauge railway crossing to buy fish from the fish shop there for a fish pie supper. The selection was fabulous and along with the pie mix I had a choice of dressed crab, cockles & mussels but plumped for a pot of crayfish tails and octopus for my lunch time snack. With our fish all wrapped up in newspaper and packed into the car we then set off towards the old lighthouse with the infamous nuclear power station looming as its backdrop. We parked near the newer lighthouse ( after passing a very tempting ‘fish shack’ ) and began our wander. There is quite a cluster of what can only be described as beach chalets, some have been left to weather with flotsam & Jetsom draped from balconies and even arranged in the gardens. Others have been modernised with some being completely new architect designed replacements for what was there before. I mention gardens but really there are no definitions of boundaries, only wheelie bins or a different style of beach-combed arrangements. Some of the newer residences( or rather holiday homes) have fences around them which only accentuates their misplace meant in their environment. There is a welcome Boardwalk which takes you from the carpark to within 50ft of the shoreline. Once you clear the ridge not only can you at last see the sea but also rows of fisherman. Rods at the ready, tents up and ready to curse any half term child running excitedly out of control towards them. We stumbled upon an artist opening his three studios. Each a wooden shed, one was the last pully shed and he told us how this six foot square hut once slept five! Paddy is a print maker who speaks in riddles and tells tales of his Uncle Arthur whose home he ‘looks after’. I have no idea if Uncle Arthur is still around, cruising the world in luxury whilst his nephew tends his railway carriages or if he’s under the arrangement of used paintbrushes at the front of the house. Each hut had a different exhibition, from wood or Lino cuts, oil paintings using the finest pigments on a beautiful dark Belgian linen to a selection of wooden panels made up from pieces of his and his neighbours homes damaged by last year’s storm. Prints ranged from a very affordable £40 and a lovely small oil that attracted Pat was under £140, justified by the quantity of a pure cadmium background. 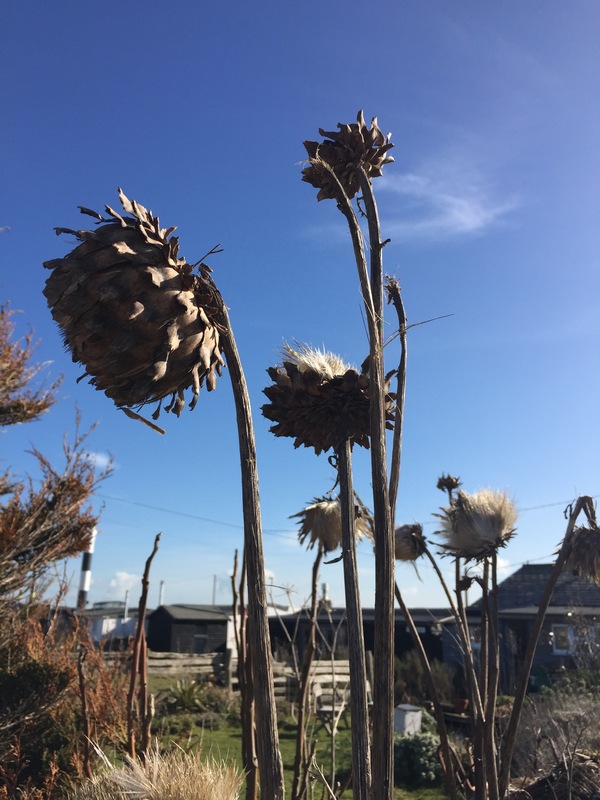 I particularly liked the dried thistle heads in the garden!